Introducing Groove Life Women’s Spring Line of Silicone Wedding Rings in 6 New Vibrantly Fresh Colors. Spring represents LIFE. NEW. GROWTH. Celebrate LIFE with our Women’s Spring Line of Silicone Wedding Bands featuring 6 vibrantly fresh color options from our Groove Thin Collection. Groove Thin Silicone Wedding Bands are made from the same durable, breathable silicone as our Groove Original Ring but slightly thinner for the woman who lives an active lifestyle and wants to look great at the same time. Rock your active lifestyle with ANY or ALL of our vibrantly fresh color options from Groove Life Women’s Spring Line: Thin Collection in Copper, Pearl, Seafoam, Turquoise, Lavender, and Coral. Designed and tested in Alaska by Groove Life’s CEO, Peter Goodwin, Groove Thin Ring is the world’s first breathable silicone ring created for active lifestyles. Groove Thin stands out for its discreet design and breathable indented grooves which allow air in and moisture out, freeing you up to live actively, safely, and comfortably. Successfully kickstarted in 2015, alongside the Groove Original Silicone Wedding Band, Groove Thin surpassed its goal and launched a company! Groove Thin is worn by women and loved by all. 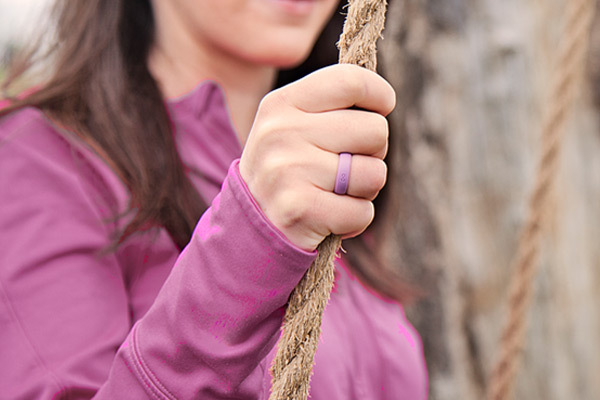 Groove Life Women’s Spring Line: Thin Silicone Wedding Bands are for all woman- the gym goddess, rockstar parent, nature lover, hairstylist, camper, hiker, painter, creative, executive, yoga fanatic, or writer. Whatever your active lifestyle is, feel ALIVE collecting one or ALL colors from our Women Spring Line, featuring six new vibrantly fresh color options: Copper, Pearl, Seafoam, Turquoise, Lavender, and Coral. This season’s must color! Make a bold statement with our vibrant Copper ring from Groove Life Women’s Spring Line: The Thin Collection Copper wedding band is designed to resemble the shiny important metal, but with complete comfort fit. Copper emotes a life lived powerfully! A whole lotta punch in one ring, you’ll be sure to stand out wearing this reddish-orange zinger during your next pilates class or a night out on the town. Rock our sophisticated chic Pearl ring this spring. Designed with pearlescent sheen, our Pearl ring from Groove Life Women’s Spring Line: Thin Collection, takes the hardest workout and makes you look good while doing it. Pearl is perfect for new brides and tough women alike. Live your life with beautiful luster in our stunning Pearl ring. Our minty Seafoam is bound to make you happy when you wear it. Channel adventure on a nature hike or playing with your kids. The Seafoam ring from our Groove Life Women’s Spring Line: Thin Collection, sports breathable function and a clean white interior. A definite conversation starter, Seafoam is the last silicone ring you’ll ever buy. Sail the seas in this ocean-influenced Turquoise ring with a crisp white interior. Ideal for beach days and the hardest workouts. Turquoise ring from our Groove Life Women’s Spring Line: Thin Collection, offers a kickstart in your active day, complete with comfort and functionality. Makes a great gift, Turquoise is for the outdoor-lover in your life! Nothing communicates LIFE like our petal-pop Lavender ring for your next outdoor workout. Lavender, from Groove Life Women’s Spring Line: Thin Collection, is like wearing a bouquet on your finger. Influenced by lilac and violet shades, Lavender is for the brave one who stands out in a field of daisies; she won’t settle for anything but the toughest ring. Wear hard; live gracefully. For the nature activist and young-at-heart, our Coral ring, from Groove Life Women’s Spring Line: Thin Collection, offers breathability and comfort for your active lifestyle needs. Show off the Coral shade of pink/orange with a bright white interior. Get outside and get wet! The best part about Groove Life Women’s Spring beside the fresh vibrant colors-- Groove’s stellar 94 Year No-BS Unlimited Warranty! No matter what happens, we will cover your Groove Ring. If your ring gets eaten by a toddler, lost on a hike, disappears in a soufflé, or damaged while saving the world, we will replace it! Our Groove mission is to blow your mind and we’ll go above and beyond to make you happy. Serving you makes us feel ALIVE! Did you know all of our Women’s rings are customizable? Check it out! The Groove Thin Collection is designed with breathable grooves on the interior of 80 durometer medical grade silicone. Colored rings are created two part construction while the metals rings are created with a premium seamless appearance. Liquid poured with inverse “comfort fit” arch. Width: 5.5mm and 2mm thickness. Sizes 4-10. Customization option includes text, image, monogram, or state.